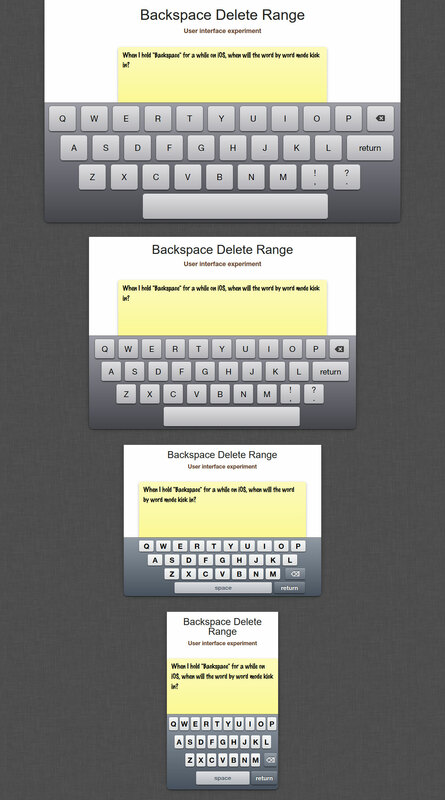 User interface mockup Highlights text that would get deleted faster if you hold backspace. Speed warning Hold backspace in the text area above to try. Use the slider to change the default range. iPhone and iPad For systems where backspace has a variable speed. Desktop and stock Android don't need this. This is a user interface mockup aimed at a very specific problem: when I hold backspace on iOS, text deletion would eventually accelerate. I find this behavior stressful. I'd like a warning for when backspace starts to accelerate. Backspace Mirror highlights in red text that would get deleted faster, and highlights in yellow text that would get deleted slower. The name Backspace Mirror is a wordplay on “backspace” and “rear-view mirror”. Backspace Mirror allows you to see rearward when you hold backspace. Also, an absurd exercise in solving a problem that shouldn't exist, playing with statistics, exploring text manipulation on the web, and unearthing a responsive iOS 6 keyboard made with CSS. Below is an in-depth case study. Detecting whether the user is holding backspace on a mobile browser is not trivial. On a physical keyboard, a key has a travel. Pressing a key can be described by at least two movements: one movement down, and one movement up. Web browsers listen to two corresponding events: keydown and keyup. Therefore, after a keydown was fired, and as long as a keyup isn't, we can assume that the user is holding down the key. On mobile, events fired by backspace behave differently. Mobile Safari fires a pair of keydown and keyup events for each backspace call, even if the user don't lift their finger. When the user is holding backspace, the machine steadily fires pairs of keydown and keyup events. If we only monitor keydown and keyup events, holding backspace and repeatedly hitting backspace are equivalent. Update February 2018: Recently, I discovered the existence of KeyboardEvent.repeat. It’s a boolean attached to keyboard events that tells whether or not the user is holding the key. This property wasn’t supported on Mobile Safari when I wrote the first version of this experiment in 2014. KeyboardEvent.repeat requires iOS 10.1 and up. The current mockup uses that property if supported, and falls back to time-lapse measurement if not. In order to determine whether the user is holding backspace or not, I measure the time-lapse between each backspace call. If it’s less than a given threshold (arbitrarily set to 150ms), I decide that the user is holding backspace. When I first wrote this experiment in 2014, I was testing it on an iPad 3. The iPad would sometimes stutter while I'm holding backspace, which makes the time-lapses spike above the threshold. This performance issue would break the algorithm. I needed some form of fault tolerance. A single irregularity in a series of otherwise steady time-lapses should be ignored. I searched for how we can quantify the regularity of a series of measures in order to ignore the faulty spikes. Such an operation is called outlier filtering and it's the domain of statistical measurement. I read about different statistical measures: variance, standard deviation, interquartile range, etc. I tried several of them, and settled on standard deviation. Standard deviation is a measure of the evenness of a data collection. The bigger the deviation, the more scattered are the data points. The smaller the deviation, the more alike are the data points. I could push successive time-lapses into an array and compute their standard deviation. If the standard deviation remains below a threshold, any outlier should be filtered and I can assume that the user is still holding backspace. Standard deviation test. The upper canvas shows the time lapse since the last keyboard event. The lower canvas shows the standard deviation of the time lapses between the last 10 keyboard events. Standard deviation threshold = 150ms. Red = above the threshold. Green = below the threshold. After a little while, we can see that even though some time lapses spike above the threshold, the standard deviation remains green, which means that we could use the standard deviation to ignore the occasional stutter! However, there is one major drawback: computing the standard deviation of the last 10 time lapses adds a “drag” to the system. That is why the first couple of standard deviations are all red. The user has to hold a key long enough without hiccups before we can use the standard deviation to filter out the outliers. The current implementation of Backspace Mirror ditches this processing altogether. The discovery of e.repeat makes the algorithm reliable on recent iOS devices. Older devices fall back to simple time-lapse measurement. The standard deviation does not depend on the absolute value of the timelapses. If we hit a key repeatedly and regularly but slowly, the standard deviation will stabilize under the threshold, no matter the threshold we set for the timelapses. 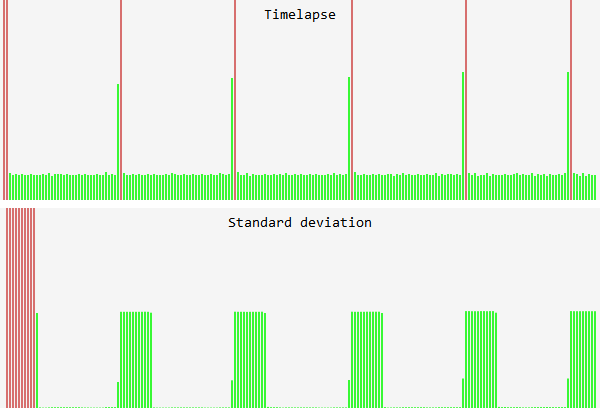 Whenever there is a change of pace in the user input, the standard deviation spikes, then decreases, then stabilizes. At this point, I got caught into philosophical considerations about statistical tools and temporal pattern detection. But it was only a way to delay the second part of the implementation of Backspace Mirror. The hardest part of this mockup was, by far, actually highlighting the text. We need a toolset to select text from position a to position b and apply a styling to that selection. Apparently this is complicated. In theory, the Selection API, the Range API and contentEditable are the tools we need to manipulate text programmatically on a web browser. The Selection API handles the user selection. It gives us information about what is being selected, like where the caret is positioned in an editable area. For example window.getSelection().anchorNode tells you where the selection is starting on the current document (any selection has a beginning and an end). The Range API allows us to set selections programmatically. For example, given a node of type text, range.setStart(text_node, offset) begins a selection range at the given offset after the start of the node. contentEditable makes any DOM element editable by the user. For example, a div element with contentEditable becomes an area where the user can write rich text. Once we have a selection, we can apply document.execCommand("HiliteColor", false, "red") to highlight the selection in red. Under the hood, the styled selection is a text node wrapped inside an element with inline CSS. For Backspace Mirror, we need to highlight a specific range of text before the caret. So we need to get the current caret position with the Selection API, then start the selection n characters before the caret with range.setStart(node, offset), and end the selection where the caret is with range.setEnd(node, offset). But we have to determine in which node the text we’re targeting is wrapped in. This DOM structure makes selecting text hilariously over complicated. I tried using the Range API to target the right nodes, and execCommand to apply and remove styling, but after many frustrating attempts, I gave up. See the Pen Highlight Text Inside a Textarea by Will Boyd (@lonekorean) on CodePen. Toggle perspective to see how the hack works. CodePen by Will Boyd. There are no nodes or hidden elements to fiddle with, because a textarea cannot contain any markup. Once we clone the value of textarea into the highlight div, we are free to style the latter however we want, as its content is entirely overwritten whenever the value of textarea is changed. But Android browsers return 0 or 229 for many different keys, which prevents from detecting backspace reliably, and therefore activate Backspace Mirror. However, this mockup was originally meant for iOS. Modern Android systems do not need this, as backspace fires steadily without accelerating. This whole experiment is lipstick on a pig. Text input on touch devices is bad, especially text editing. But studying a specific technical problem is often a good exercise. 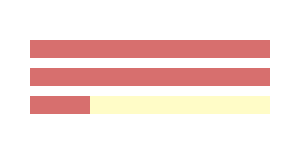 Playing with statistics to characterize user input was interesting, while battling with text manipulation on the web was maddening. My sympathy goes out to developers who make web-based text editors. I found that iOS accelerates after 21 characters. Samsung keyboard on Android 7 (Galaxy A7) accelerates after 11 characters. Gboard on stock Android 7 does not accelerate. When I hold backspace on Mobile Safari, the browser fires a pair of keydown and keyup events every ~100ms. When I hold backspace on a desktop browser, a keydown event is fired every ~25ms. Backspace Delete Range. First version of Backspace Mirror, 2012. Math is Fun, Standard Deviation and Variance. W3C, Overview of the issues of editing text in a browser, 2017. Sten Hougaard, execCommands examples, 2017. Nick Santos, Why ContentEditable is Terrible, 2014. Will Boyd, Highlight Within Textarea, 2015. Making of. Chromium Bugs, Android keyboard event bug, an open thread since 2012.